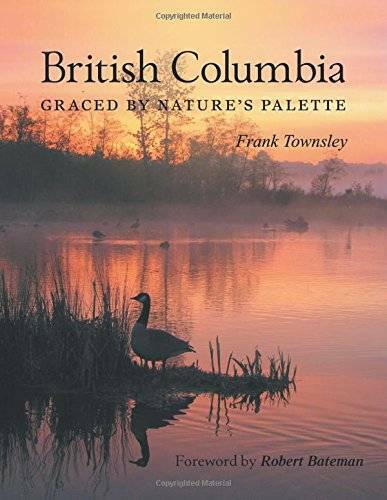 Frank Townsley, "British Columbia: Graced by Nature's Palette"
British Columbia is blessed with spectacular beauty and diversity, from its coastal shores and temperate rainforests to the Rocky Mountains, from its southern deserts to the northern sub-Arctic tundra. 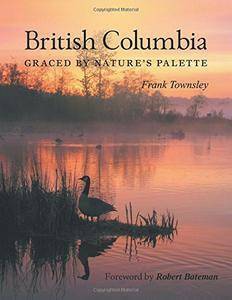 This book will take you on a wondrous and extensive journey through British Columbia in all its seasons, divulging not only its varied landscapes, but displaying some of the abundantly rich nuances of plant and animal life, many existing nowhere else in Canada. The book will showcase rarely seen wildflowers, berries ready for the picking, as well as mushrooms, lichens, mosses, and ferns all fighting for light on the forest floors. It will unveil unique wildlife behaviour, colourfully painted insects, pesky rodents, stunning birdlife (and their lovably whimsical offspring), and a profusion of majestic land and marine mammals. Images of Vancouver and Victoria, as well as abandoned relics from the past returning to nature all complement British Columbia's natural beauty, becoming essential to the inherent mosaic that defines this province. With its varied and wondrous landscapes, graced by its diversity of flora and fauna, British Columbia is arguably one of the most unique gems of this planet, all the while shouting out for its preservation.